Recently on twitter I was pointed to an essay on Final Fantasy VIII that differs from the more generally accepted reading of the game’s story. If you have not read it yet, before you proceed with this post, please do. First let me speak on the essay itself. I think it’s a beautifully argued and supports its position admirably. The Squall’s dead theory hadn’t ever occurred to me. Never once did it enter my mind that discs 2-4 were a death dream. I think it’s somewhat the problem of video games where we are used to these crazy and fantastical elements that we are never able to question their validity, whether we are supposed to or not. They are par for the course and we just accept them. On thinking about it I prefer this reading of Final Fantasy VIII, than what you see is what you get. Having said that there is a mistake that goes into thinking how to read a creative work. Part of it stems from the idea of authorship and part of it comes from the idea that works have a single message or single point they want to drive home. This is a mistake, but it does not mean it’s wrong. I bring up Mulholland Drive for two reasons. One because it embodies what I want to talk about probably better than any other work that springs to mind. And two, because I took two bloody classes on the movie and I’m damn well going to show off. I called Final Fantasy VIII the Mulholland Drive of video games on twitter the other day, mainly to make the comparison of artistic craft and not using it to legitimize video games. I brought it up, because comparing two works with similar themes, content and/or goals is standard practice in criticism and I think this comparison is apt. When you first watch Mulholland Drive it seems to make sense until around 2/3rds of the way in, and then it’s ending devolves into a strangeness that is almost incomprehensible. It takes several viewings to understand what you are looking at and what it means. The movie follows dream logic, or rather nightmare logic. Without going into a detailed essay on David Lynch’s masterpiece I will say that the prevailing reading on the movie is that the second half of the movie is the real world and like the FFVIII theory above, the first half is a death dream. Diane at the end of the movie shoots herself in a moment of madness, terror and remorse. In that moment of death she dreams the first half of the film. Applying elements from the real portion of the film into her dream trying to make sense of the world, where she is the successful actress, she is nice and she gets love. If you read the essay like I suggested you should, then you will already see the parallels in the story. Going further into the details is not what I want to do right now and would require a rewatching of Mulholland Drive and a replay of FFVIII. The thing is withy in this story reading there are other readings with the specific element of the movie. Like image theory and how certain images are there to evoke certain feelings in the audience, commentary on Hollywood readings, feminist readings and LGBT readings. The idea that it’s all a dream may contradict with certain assertions or maybe just certain pieces of evidence of the other readings does not disqualify them. In fact there is another theory that outright disregards the death dream theory and asserts that the two sections of Mulholland Drive are actually two realities where the consciousness of one woman transfers to the other through the blue box. Parallel worlds where the blue box is a gateway (aka a hypercube) from a Shakespearean comedy inspired world to the Shakespearean tragedy inspired world. It sounds strange, but when you hear the full argument it makes perfect sense. It uses classical literary notions to signify the differences between the two worlds and complex entities unto themselves and in a way comments on art by showing the similarities between comedy and tragedy by degrees. Out of the two main theories it’s the one I prefer. So what do I see when I see this other interpretation of Final Fantasy VIII? Well first an opportunity to write an essay on the idea of criticism, but also an opportunity to hopefully explain how criticism works since so many seem not to get that it’s not an either/or proposition. Audience input is paramount in every medium. It’s just more obvious and tangible with games. 3 Responses to "The Nature of Reading: Interpretation and Auteurism using Final Fantasy VIII and Mulholland Drive"
That theory really answers nothing, and it is factually wrong. Good work on missing the larger point of my post. Interpretation of a work cannot be factually wrong as if there is a single correct interpretation of a work. The more abstract the work, the more room for various interpretations there are. You may not like or subscribe to a particular interpretation, but that does not make it wrong. 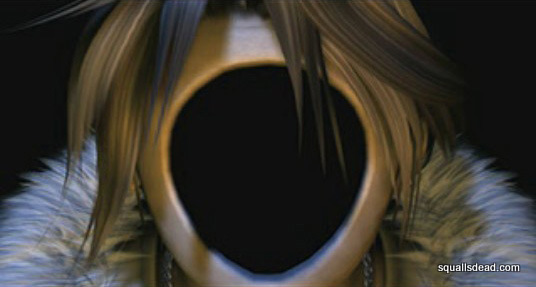 About the theory, in my opinion… Squall not dies in the game. (spoilers) If he die on Disk 1 everything that follows from disc 2 onwards would not make sense, we would not know the role of Edea, the connection with Laguna, Ellone, etc. Squall does not die in disc 4 (spoilers) because the the video where Selphie and Irvine filmed the celebration after beating Ultimecia, everyone is happy, that means that everything went well (include Squall alive). Also, Kitase in the interview in the Ultimania says that in the game there is a happy ending.